Goo-Net: BROWN 610 BLUEBIRD SSS! BROWN 610 BLUEBIRD SSS! 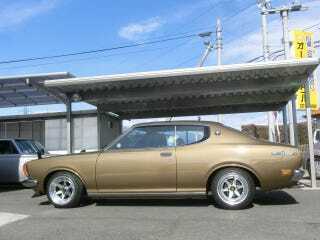 BROWN BLUEBIRD 610 SSS! The 610 is a 510 that they actually bothered to give styling. And it rules. It looks like an 8/10 scale Hakosuka Skyline. And when I say it’s a 510, I mean it. They’re so mechanically similar that most parts are completely interchangable. So you have a car that handles incredibly well, along with having massive aftermarket support. And it’s an SSS, so it gets the twin-carb version of the L16 (although I think this might be an SSS-E, so it has a Bosch EFI system), good for 110 horsepower (output is the same for both carbed and fuel injected models). It’s not as gonzo of an engine as the Yamaha twincam engines that Toyota was using at the time, but the car only weights ~2200 pounds. It’s been tastefully modified, with a front spoiler and period-correct wheels (and I think some suspension work, by the looks of it). Sadly, prices on Japanese classic cars are climbing again, especially for cars in Japan. However, for a car as rare as this is (seriously, 2-door 610s almost never turn up, and rarely this clean), in the condition that it’s in, $31,660 is more than reasonable.